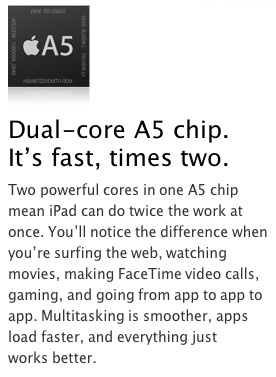 iPad 2 to Match iPhone 4's 512 MB of RAM? While Apple yesterday touted its new A5 system-on-a-chip with a 1 GHz dual-core processor in the forthcoming iPad 2, the company declined to report how much RAM is included in the package. The original iPad offers the same 256 MB of RAM that was found in the iPhone 3GS, but that standard has since been surpassed by the iPhone 4 and its 512 MB of RAM. Gizmodo yesterday sparked fears in some users when it reported that an Apple representative had initially revealed at an iPad 2 hands-on event in London that the device carries the same 256 MB of RAM found in the first-generation models. According to the report, a senior public relations representative from Apple quickly backtracked from that claim, however, and noted that the company could not confirm how much RAM is included in the iPad 2. That claim has been further disputed by Kakeun Lee, a semiconductor analyst with Korean firm Hana Daetoo Securities, who yesterday issued a Tweet [Google translation] claiming that the iPad 2 does in fact match the iPhone 4 with 512 MB of RAM. Lee further claimed [Google translation] that the iPad 2 will utilize LPDDR2 RAM, and improvement over the LPDDR1 RAM found in the original iPad. It is unclear on what sources Lee is basing his claims, but his area of focus is in mobile DRAM companies such as Samsung and Hynix that deliver chips for Apple's iOS devices. Apple has long shied away from issuing public statements on RAM included in its iOS devices, preferring to focus on the user experience, and Apple made no exception in its iPad 2 introduction by promoting the machine has being twice as fast and offering up to nine times better graphics performance than its predecessor.